It was on our itinerary. We came to know about Casabrina in one of the forums. We didn’t know where Casabrina is located specifically. We only knew it is located in Bentong. We found it in the least unexpected place. In fact, my wife saw it by accident. This happened after our durian session in Kampung Sang Lee. 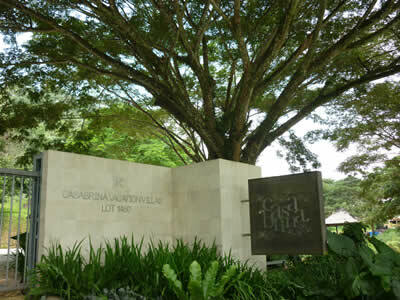 In fact, Casabrina is just a stone throw’s away from where we had our durians – less than 500 meters. It is situated at old Bentong-Raub road which also leads you to Kampung Tras and Fraser’s Hill. Casabrina is a luxury residence project by Felix Tee. 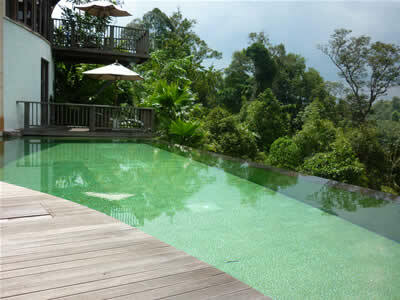 According the website, there are 11 villas altogether – which are all nestled in tropical rainforest. 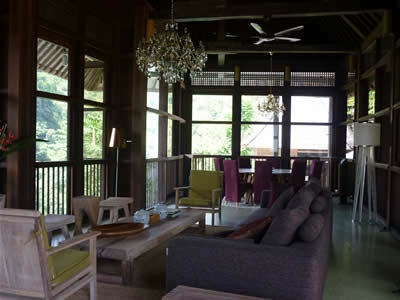 The architect behind this project is Yoka Sara – Bali’s famous contemporary architect. Every residence comes with a piece of land (with trees of course) and a swimming pool. The bungalows are built in harmony with the environment. Hence, destruction to the surroundings is maintained to the minimal. When my wife saw the place, I stopped at the entrance. There was no one at the guard house. After a while, a man on a motorcycle came to the gate. Only then did I realize there was a CCTV at the entrance. The man must have seen us from far via CCTV. I asked the man if we could pay a visit to the bungalow. He said the owner was not in and we were not allowed to go in. I didn’t give up and I tried to convince him to let us in. It must be my lucky day because he finally gave in. I was ecstatic. The man led us to the top of a small hill where the bungalow is located – through a small, winding road. The villa is built on the slope of a hill. The moment I stepped in the bungalow (later I found out this villa is called Villa Amertani), I immediately fell in love. I love Balinese houses! This is like my dream house! The first part of the house we saw was the horizon swimming pool and a patio-like meeting place. The house is overlooking the mountains – very soothing to the eyes. For a nature lover like me, this place felt like heaven on earth. The man that let us in was very helpful, friendly, and patient. He was busy talking on the phone and trying to get the keys to the house so that we could get an inside view of the house. The wooden villa has two storeys. There was some renovation work going on at the bottom storey – where bedrooms are located. The bungalow has an open concept with floor-to-ceiling windows. While browsing the guest book on the table, we saw names of some VIPs and celebrities who stayed there before. This again shows that it is no ordinary house. While touring around the fantastic house, I posed some questions to the man (I should have asked for his name). When he couldn’t answers, he called a Mr. Yee for help. Mr. Yee told us that he is responsible for the construction of Casabrina villas. He explained that only after a buyer purchases the lot and bungalow do they start building. The design of each bungalow is already done and owners have to build the bungalows according to the plan. Note: This is the 3rd article of A Family Road Trip to Pahang: Bentong, Raub, and Kuala Lipis series.